I’m really not a great sales person. Unfortunately, I’m also not someone who can do a job I don’t really believe in. Probably because I’m not a good sales person! So I’ve had to learn to make money doing something that I love. There’s really not another option for me. If I can’t do work with purpose, I just won’t have money in my bank account. Starving artist, for real. I’ve often wished to be different. I used to wish I could just clock in and clock out and find happiness outside of work, but that’s just not how my brain — or my heart — works. So, here I am, determined to make a living from my passions and talents. And because of that, I’ve had to learn how to be a marketer. Or let me rephrase that, I’ve had to learn how to spread my message, so I can reach the people who need the words, plus make some money, honey. I believe in callings. Mine has intersected with my work, and I bet yours has, too. So, if we want to do well by our calling, we have to make sure our mission is seen and heard, right? If not, just pack your bags. If you’re not doing everything in your control to spread your message to the right people (which, of course, takes time and patience! ), you’re kinda gypping people — the people who could benefit from your work. Plus, seriously, we deserve to make money doing something we love. Period. But in an effort to not gyp your people, may I suggest brushing up on your non-sleazy marketing techniques? We’ll talk about several as the months go on, but today let’s talk about the Guest Blog Post. We do this to reach a whole new audience through an already trusted advisor. If you write a post for The Huffington Post, let’s say, the reader automatically has some sort of faith in you because she trusts The Huffington Post. She has a relationship with HuffPost, and she believes it only puts out good articles by credible sources. You can write the same post for your website and not be as trusted by a new reader who maybe just found you on Google. It could be the exact same content you put on HuffPost, but she’s still going to question your legitimacy because she doesn’t know you yet. We don’t write guest blog posts because it might seem cool to write for HuffPost, which of course is nice, but unless you’re a professional writer, that credential might not help much. We guest blog post for the exposure to a new audience who will be warmed to your message because you are being endorsed by the website owner or editor. The hope is that their people, eventually become your people. There’s definitely a right way and a wrong way to write a blog post. I only know this because I’ve done it the wrong way several times! And honestly, it’s as if I never wrote the thing. When you do it wrong, it just doesn’t yield the results you need. Some bright, shiny publication with a large readership may come your way and ask you to write post, but if the topic of the post isn’t inline with your message, it’s not worth it. For example, let’s say you’re an accountant by day, but you’re working to move into creating a YouTube series full time. If Forbes asks you to write a story on accounting, you might want to turn it down. Why? Because you have to ask yourself, what you want to put out there. What do you really want to be known as? Do you want to continue being the accountant or do want to be known as the producer of a hit series on YouTube. I know you might disagree with me. But believe me, these opportunities will continue to present themselves until you tell the universe you are serious about being a full-time producer. When guest blog posting, make sure the topic is relevant to the work you want to be known for. Because when someone reads your awesome post, they may want to read more of your work or even hire you. If your messaging is all confused, that person is just going to forget you. Or worse, they’ll offer you money for a career you’re trying to get out of. In a moment of weakness, you might say yes, and you’ll never find yourself completely out of that former career. Just because a publication has 100,000 readers a day, that doesn’t mean it’s the right fit for you. You want to write for a publication that attracts the kind of reader that would be interested in your work. If you write about family recipes and a really popular fashion blogger asks you to write a guest post, you have to ask yourself if it’s really worth it. Are her readers really going to like your work? It would be a better strategy to go after mom bloggers who might have a smaller readership, but at least you know their readers are moms who probably are looking for family recipes. That’s worth your time. 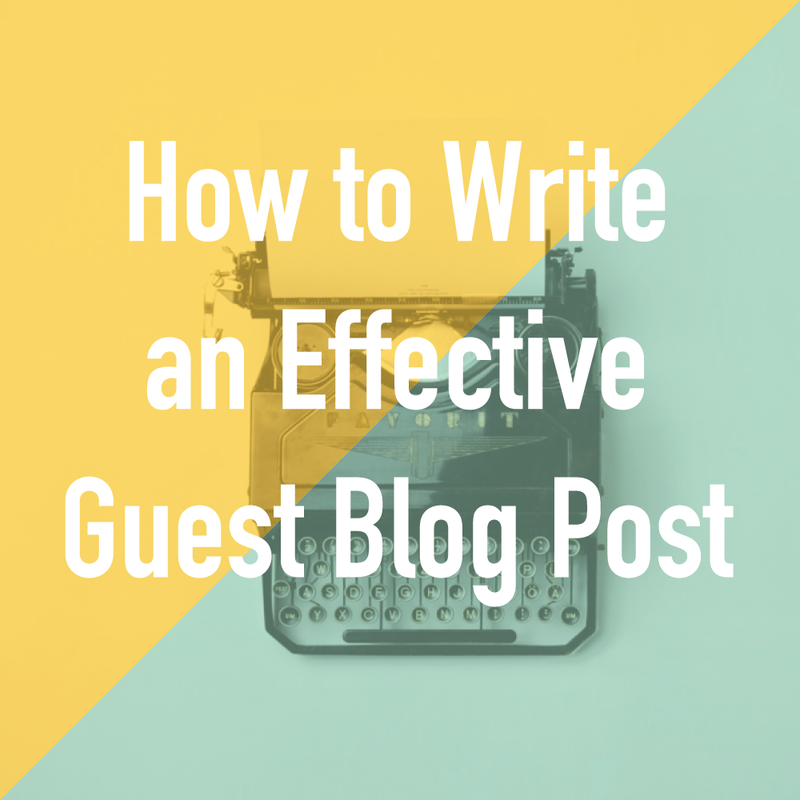 When you’re writing a guest blog post for someone, remember, you’re doing them a favor. Sure, they might have more of a following than you, but at the end of the day, you’re creating free content for them. With that said, it’s okay to ask for a favor back. At the very least, ask for a short bio and a link to your website. If it makes sense, ask if they can link to your latest product or offering. The best would be if you could offer their readers something for free in exchange for their email address. Just don’t forget to ask for what you need. Lastly, write something beautiful. I bet you love your readers so much that you’re always doing a great job for them. But maybe when you’re writing for someone else, you’re not too sure who the reader is so you might feel a little shy. Don’t be. Give it all you got. After all, this might be the beginning of a beautiful friendship. Good reminder to focus on our goals and write to our audience. Thanks! You are so welcome, Barbara. Looking fwd to watching you hit those goals! Thanks for the article Nikki, I really appreciated it. By the way, the way you write is so encouraging. Thank you, Liege! So happy that it spoke to you. I love this! So informative and helpful. I’m really glad you mentioned being picky with publications and messages because it’s a reflection of your personal brand.